This is my second lamp I've made. 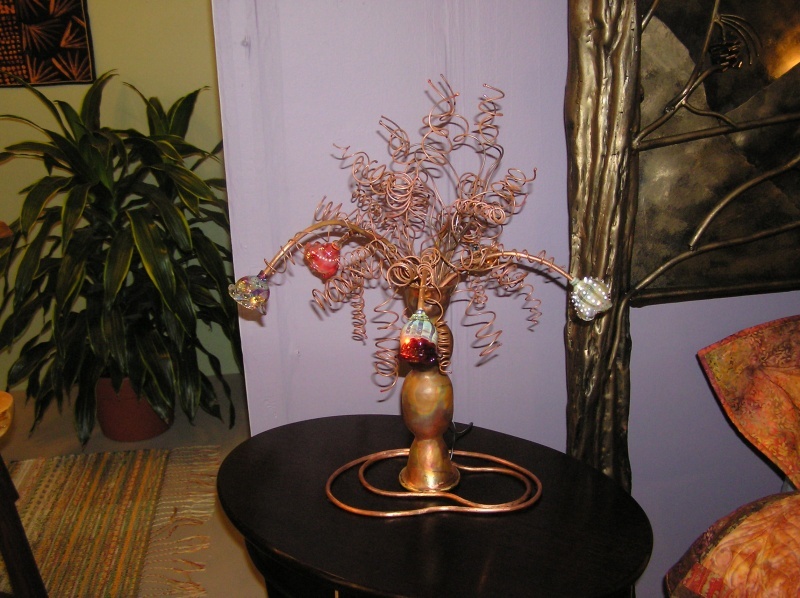 It is called Tree of Life, made of copper and brass. Nancy Tobey, my glass bead friend, gave me a number of tiny glass shades she made and asked if I could try making something using them, so after a half year of thinking, this is my result. The lamp base was a copper tube I formed into a sculptural stem back in college, which is over 20 years ago. It's taken me this long to do something with the copper tube. The bottom of lamp is to represent water ripples. The tree branches is recycled copper electrical wire I had. 5 pieces of thin copper tubing were used to hold each glass shade. I had my father wire the lamp, and it was a challenge for him. He ended up using Christmas lights since it was the smallest he could find on short notice but it works. The lamp is shown on display at the Living with Crafts Exhibition at the Annual Craftsmen's Fair.